var. hookeri M.C. Johnston: west side of Cascades from northern CA to B.C. Wide elevational distribution. 1500-7000 feet in WA and OR. Common on sites with 18-23 inches of annual precipitation and warm, dry summers. Early to mid-seral dominant in most of dry Douglas-fir forests of PNW and northern Rockies. Open, rocky hillsides and sunny sites or partially shaded forests until shaded out by increasing tree cover. Moderately dry to moderately moist mountain slopes, especially south aspects. Mesic sites best. Early and sometimes mid-seral dominant. Fire-adapted nitrogen fixer. Comes in 1-7 years following a disturbance and codominates with other plants. Forms large, dense colonies, thickets up to 33 feet wide. Can sprout from root crown after damaged or topkilled. Can also spread by layering. Produces abundant seeds which are forcibly ejected when ripe and seed banks in soil. Depends on plant community. In ponderosa pine communities, bitterbrush, willow, snowberry, and rose. Seed: Collect when capsules brown and enclose in fine mesh bags. Seeds tan at maturity. Cuttings: Summer semi-hardwood stem cuttings. Collect late April to early June. Evans has used 20-30 minute sulfuric acid soak, followed by neutralization with lime, a 48-hour running water soak, and then a 90-day cold moist stratification. Up to 20 years in dry storage (Evans). But seed can regerminate from seed stored in soil for “several centuries”, especially in dry soils. (Anderson) So, perhaps seed can be stored much longer if left in soil. Dry storage or maybe in dry soil (seeds found in soil of Douglas-fir/Grand fir habitat types were 91% viable). Seed: Follow dormancy-breaking requirements outlined above. Hand sow seed. Cuttings: Treat with IBA and place in mist bed with bottom heat and cover with shade cloth. Root in about 8 weeks. Roots susceptible to excess moisture and should be uppotted to well-drained media. After potting, put in shadehouse for 4 weeks and then move to full sun and leach containers. Fertilize in August-September and reduce irrigation gradually September-October and give final irrigation before winter. Transplant cuttings in spring, first or second year. Grows in almost any soil. Best in medium to coarse-textured well-drained soils with low nutrient content. Usually found in soils with PH 5.5-7.0. Cuttings should be inoculated with nitrogen-fixing organisms. Cuttings require frequent watering for first year. Life span 25+ years, although stands may deteriorate after 15 years. Slow growing first 3-5 years, but then rapid growth until about 10 years after which growth levels off. Produces first seed when 3-6 years old. Produces abundant seed and seed banks in soil up to 200 years. Anderson, Michelle D. (2001, November). 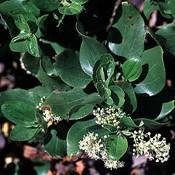 Ceanothus velutinus. In: U.S. Department of Agriculture, Forest Service, Rocky Mountain Research Station, Fire Sciences Laboratory (2003, June). Fire Effects Information System, [Online]. Available: http://www.fs.fed.us/database/feis/ [June 2, 2003]. Evans, Jeff; Luna, Tara; Hosokawa, Joy; Wick, Dale. 2001. Propagation protocol for vegetative production of container Ceanothus velutinus Dougl. plants (800 ml containers); Glacier National Park, West Glacier, Montana. In: Native Plant Network. URL: http://www.nativeplantnetwork.org (accessed 2 June 2003). Moscow (ID): University of Idaho, College of Natural Resources, Forest Research Nursery. USDA, NRCS. 2002. The PLANTS Database, Version 3.5 (http://plants.usda.gov). National Plant Data Center, Baton Rouge, LA 70874-4490 USA.